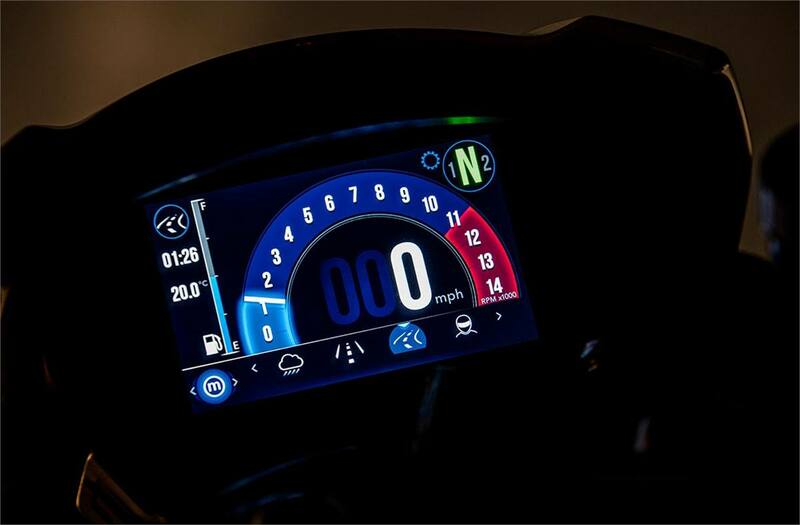 New TFT Color Instruments: Full-color 5-inch TFT instrument display that presents both essential and additional rider information from the on-board computer, with three screen styles to choose from, all with high and low contrast settings, adjustable for optimum visibility. 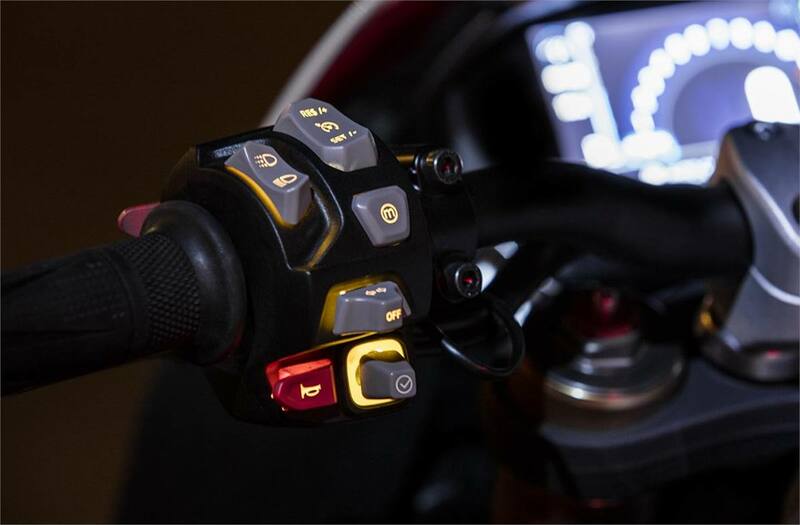 New Illuminated Switch Cubes: Ergonomically optimized stylish new backlit switch cubes for fast intuitive access to bike functions, including 5-way joystick to navigate TFT instrument screen, riding modes button and new cruise control switch. 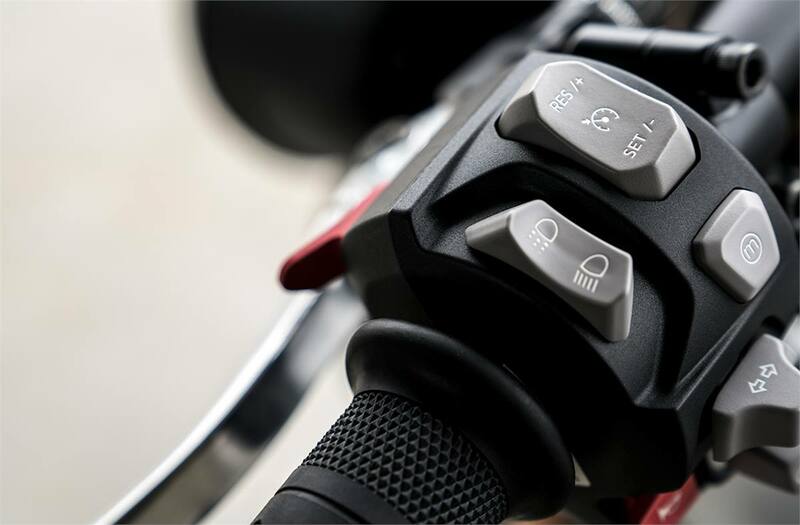 Four Riding Modes: Easily accessed through the left hand switch cube, choose from four riding modes, Rain, Road, Sport and Rider-configurable. 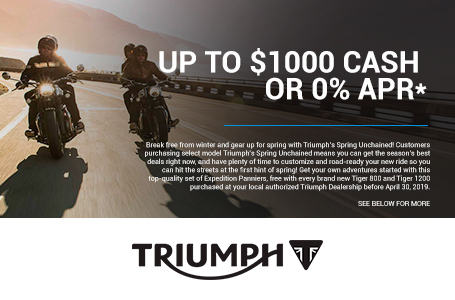 Each altering the throttle map, ABS and traction control settings to suit the conditions or desired riding style. 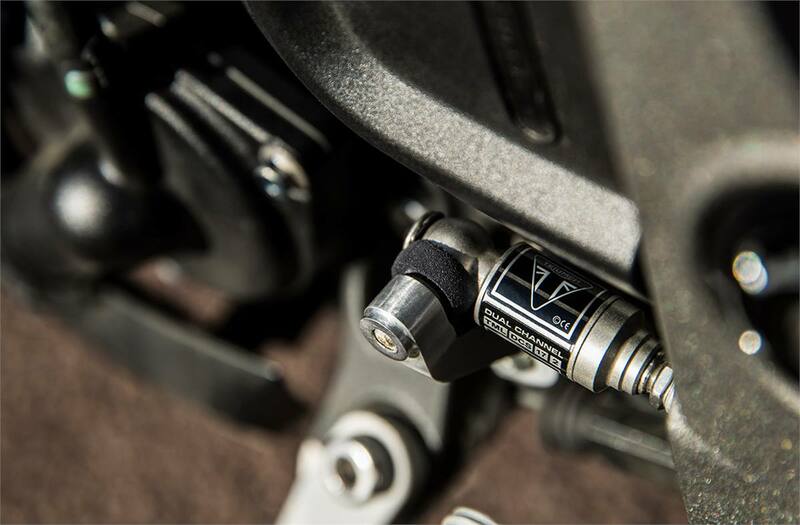 New Cruise Control: Fitted as standard for the first time on the Speed Triple, cruise control can reduce rider fatigue on long distance journeys and is quickly enabled and disabled via the left hand switch cube for additional convenience. DRL Headlights: Daytime Running Lights are an impressive way of increasing your visibility with a distinctive light profile. These are incorporated into the headlamps, which are set characteristically low to reflect the Speed Triple’s nose-down focused attitude. 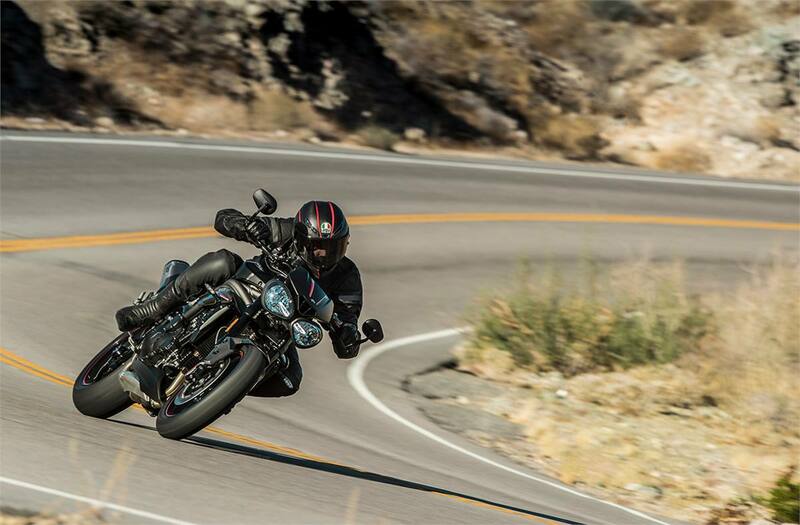 Major Engine Update and Improved Gearbox: The new Speed Triple is lighter, with an updated 1050cc engine, more responsive throttle, and improved gearbox to deliver even more power and the most agile, sharp and focused ride you’ve ever had on this explosive bike. Graded Slip-Assist Clutch: Improving the clutch ‘feel’ by reducing lever effort, bringing a lighter touch than you’d expect; perfect for long journeys or stop-start urban commutes. New Restyled Silencers: Contemporary new black, race-style, freer flowing twin upswept silencers, with a larger bore and a more slender stainless steel end cap, and aluminum heat shield. 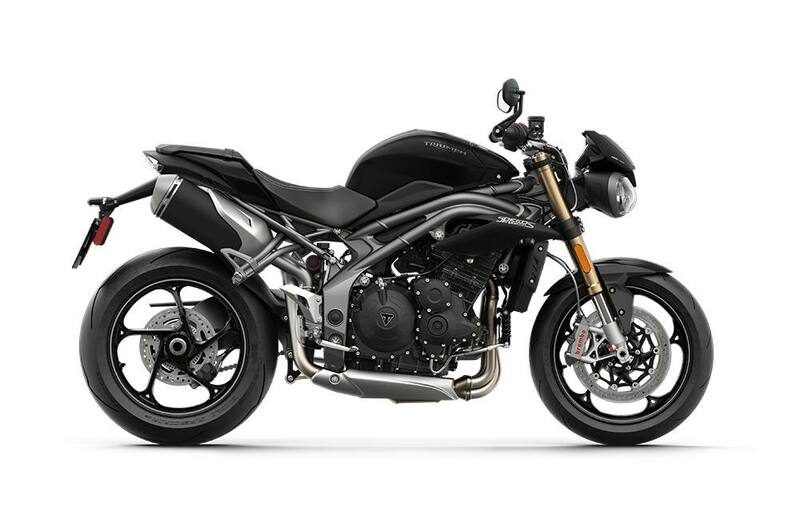 New Wheels with High Specification Brakes and Tires: There’s a more contemporary high-gloss finish to the new Speed Triple cast alloy wheels, while high-spec Pirelli Diablo Supercorsa tires and twin disc front brakes with Brembo Monobloc calipers provide an even greater feel and control.